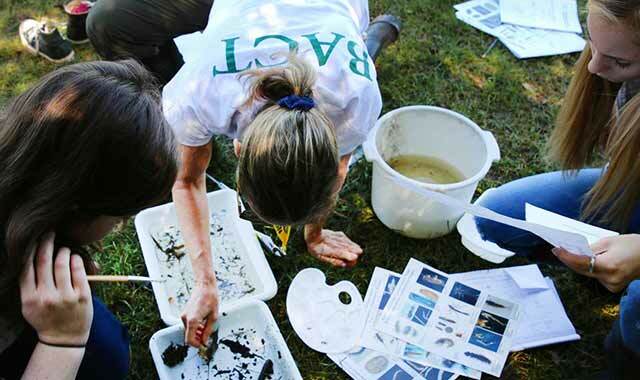 Susan Lenz, in white T-shirt, evaluates samples during an environmental science class outing. Kartik Sarangmath has always had an interest in nature. Every summer, his parents take him and his younger sister, Aditi, to national parks like Glacier park in Montana, Yosemite in California, Yellowstone in Wyoming and Antelope Canyon in Arizona. Last summer, the suburban high schooler took part in a unique internship through the Barrington Area Conservation Trust (BACT). For three hours a day, the junior at Barrington High School (BHS), along with another student, shadowed staff and volunteers working on stream monitoring at Pederson Preserve, located across from the high school. Sarangmath was amazed by the experience. BACT seeks to preserve the region’s open spaces for current and future generations. Since it started in 2001, it has preserved nearly 500 acres of land, primarily through conservation easements, with the goal of preserving 1,000 acres by the year 2020. BACT promotes conservation among area residents through numeous channels. Its latest program, Conservation@School, is a partnership with Barrington High School that introduces students to conservation through classroom programming, after-school volunteering, summer internships and other special events. Susan Lenz is the coordinator for Conservation@School. A teacher by trade, Lenz left the classroom to work with organizations like park districts and conservation districts. The BHS partnership is one of many ways that BACT reaches the community. It also promotes conservation techniques through its Conservation@Work (aimed at environmentally conscious businesses) and Conservation@Home (aimed at home gardeners) programs. In 2015, Conservation@School was launched with the support of BHS teachers, students and staff. Honors and AP environmental students now engage with the preserve by learning about stream ecology and water quality monitoring of Flint Creek, which passes through the property. Before Conservation@School began, BACT was already working with BHS horticulture volunteers on new native plant cultivation projects in the school’s greenhouses. Mike Kedzie is a biology and environmental science teacher at BHS. Last year, his students planted 5,000 purple coneflowers in the school’s greenhouse, half of which were replanted at Pederson Preserve as part of Earth Day. This year, Kedzie’s classes are planting prairie plants and clearing the creek of invasive species. Other schools have environmental clubs, says Lenz, but Conservation@School is different. Lenz hopes eventually to expand the program to Harper College in Palatine. Last spring, about 50 BHS students joined staff and BACT volunteers to set new native plants and remove debris from Pederson Preserve. The effort was part of BACT’s fourth annual Earth Day Work Day. Sarangmath was part of the group that participated. Lenz says the possibilities for the program are endless. BACT leaders, who meet regularly with teachers, hope to not only expand programming but offer field trips to organic farms. Kedzie has seen a difference among some of his students. Sarangmath has noticed his colleagues’ newfound interest. This entry was posted on Monday, October 10th, 2016 at 11:38 am	and is filed under Features, Top Posts. You can follow any responses to this entry through the RSS 2.0 feed. Both comments and pings are currently closed.